The "Afterward" chapter of Becoming Real in 24 Day includes a few photographs of various advocacy events of the early 2000's. Here are more photographs from those events. The Musical: "Hello/Goodbye Ada Who?" The takeover of the performance floor at Governor Gray Davis' 2003 Inauguration Ball. In 2002, CA Governor Gray Davis and CA Attorney General Dan Lockyer filed with the U.S. an appeal to overturn a decision in the Hason v California Medical Board of Examiners case. The Hason case was not a good test case for the ADA, and we feared that we would lose Title II of the ADA that prohibits state and local governments from discriminating against PWD. One of our strategies was to take over the performance floor of Governor Gray Davis's inaugural ball. Raising an American flag attached to a white cane (courtesy of Sheela Gunn) by urinary leg bag straps, we refused to leave until we had a promise of a meeting with the governor, which we received the next day. Our tactics and publicity gave Governor Davis and Attorney General Bill Lockyer the impetus to do what I think they would rather have done, anyway. They stopped their appeal only two weeks before it was to be heard by the Supreme Court, a historical first. The photographs are by Pedro Homem de Gouveia, architect and accessibilityspecialist in Portugal. 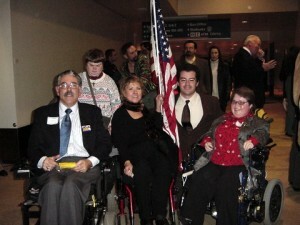 In 2006, the California Building Industry Association and the California Restaurant Association, with support from the California Chamber of Commerce, put an initiative on the state ballot that would have eviscerated the enforcement of disability civil rights and, by default, created a special sub-class for people with disabilities. 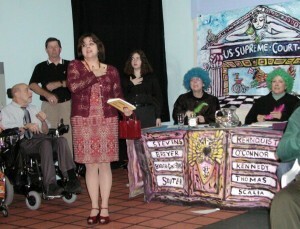 Various disability rights organizations staged a street theater protest in Sacramento that was well attended by the press. The initiative was dropped, though every year since then, the same interests succeed in having bills similar to the withdrawn initiative introduced in the CA legislature. In 2004, The Tennessee v Lane case went before the U.S. Supreme Court. Based upon a states' rights argument, Tennessee's Attorney General was appealing to the court a lower court decision that state court houses have to be accessible to persons with disabilities. 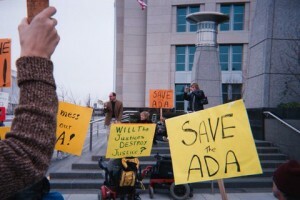 At stake was Title II of the ADA, and activists all over the country staged "Crawl for Justice"
demonstrations at state court houses and on the U.S. Supreme Courthouse steps. 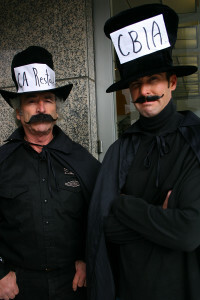 Here are photographs of the Crawl for Justice at the Federal courthouse in Sacramento. In a 5-4 vote, the justices ruled in favor of the particular portion of the ADA which requires that state courthouses be accessible.